"Gwion" redirects here. For other uses, see Gwion (disambiguation). For other uses, see Taliesin (disambiguation). Taliesin (fl. 6th century AD; /ˌtæliˈɛsɪn/; Welsh pronunciation: [talˈjɛsɪn]) was an early Brythonic poet of Sub-Roman Britain whose work has possibly survived in a Middle Welsh manuscript, the Book of Taliesin. Taliesin was a renowned bard who is believed to have sung at the courts of at least three Brythonic kings. Ifor Williams identified eleven of the medieval poems ascribed to Taliesin as possibly originating as early as the sixth century, and so possibly being composed by a historical Taliesin. The bulk of this work praises King Urien of Rheged and his son Owain mab Urien, although several of the poems indicate that he also served as the court bard to King Brochfael Ysgithrog of Powys and his successor Cynan Garwyn, either before or during his time at Urien's court. Some of the events to which the poems refer, such as the Battle of Arfderydd (c. 573), are referred to in other sources. In legend and medieval Welsh poetry, he is often referred to as Taliesin Ben Beirdd ("Taliesin, Chief of Bards" or chief of poets). He is mentioned as one of the five British poets of renown, along with Talhaearn Tad Awen ("Talhaearn Father of the Muse"), Aneirin, Blwchfardd, and Cian Gwenith Gwawd ("Cian Wheat of Song"), in the Historia Brittonum, and is also mentioned in the collection of poems known as Y Gododdin. Taliesin was highly regarded in the mid-12th century as the supposed author of a great number of romantic legends. According to legend Taliesin was adopted as a child by Elffin, the son of Gwyddno Garanhir, and prophesied the death of Maelgwn Gwynedd from the Yellow Plague. In later stories he became a mythic hero, companion of Bran the Blessed and King Arthur. His legendary biography is found in several late renderings (see below), the earliest surviving narrative being found in a manuscript chronicle of world history written by Elis Gruffydd in the 16th century. Details of Taliesin's life are sparse. The first mention of him occurs in the Saxon genealogies appended to four manuscripts of the Historia Brittonum. The writer names five poets, among them Taliesin, who lived in the time of Ida of Bernicia (fl. mid-6th century) and a British chieftain, (O)utigirn (Modern Welsh Eudeyrn). This information is considered fairly credible, since he is also mentioned by Aneirin, another of the five mentioned poets, who is famed as the author of Y Gododdin, a series of elegies to the men of the kingdom of Gododdin (now Lothian) who died fighting the Angles at the Battle of Catraeth around 600. 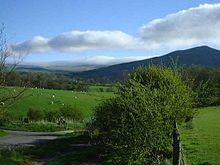 Taliesin's authorship of several praise-poems to Urien Rheged (died c. 590) is commonly accepted, and these poems mention The Eden Valley and an enemy leader, Fflamddwyn, identified as Ida or his son Theodric. These poems refer to victories of Urien at the battles of Argoed Llwyfain, The Ford of Clyde and Gwen Ystrad. Taliesin also sang in praise of Cynan Garwyn, king of Powys, Wales, and Cynan's predecessor Brochwel Ysgithrog is also mentioned in later poems. According to legends that first appear in the Book of Taliesin Taliesin's early patron was Elffin, son of Gwyddno Garanhir, who was a lord of a lost land in Cardigan Bay, called Cantre'r Gwaelod, and Taliesin defended Elffin and satirised his enemy, the powerful Maelgwn Gwynedd, shortly before the latter died (probably in 547 CE). According to the Welsh Triads Taliesin had a son, Afaon, who was accounted a great warrior who suffered a violent death, probably in Lothian. Taliesin's own grave is held in folk-lore to be one near the village of Tre Taliesin near Llangynfelyn called Bedd Taliesin, but this is a Bronze Age burial chamber, and the village of Tre-Taliesin, located at the foot of the hill, was actually named after the burial chamber in the 19th century though legend was traced by Edward Lhuyd to the 17th century. More detailed traditions of Taliesin's biography arose from about the 11th century, and in Historia Taliesin ("The Tale of Taliesin", surviving from the 16th century). In the mid-16th-century, Elis Gruffydd recorded a legendary account of Taliesin that resembles the story of the boyhood of the Irish hero Fionn mac Cumhail and the salmon of wisdom in some respects. The tale was also recorded in a slightly different version by John Jones of Gellilyfdy (c. 1607). This story agrees in many respects with fragmentary accounts in the Book of Taliesin. According to the Hanes Taliesin, he was originally known as Gwion Bach ap Gwreang. He was a servant of Cerridwen and was made to stir the Cauldron of Inspiration for one year to allow for Cerridwen to complete her potion of inspiration. Upon completion of this potion, three drops sprang out and landed upon Gwion Bach's thumb. Gwion then placed his thumb in his mouth to soothe his burns resulting in Gwion's enlightenment. Out of fear of what Cerridwen would do to him, Gwion fled and eventually transformed into a piece of grain before being consumed by Cerridwen. Gwion was then reborn and given the name Taliesin. According to these texts Taliesin was the foster-son of Elffin ap Gwyddno, who gave him the name Taliesin, meaning "radiant brow", and who later became a king in Ceredigion, Wales. The legend states that he was then raised at his court in Aberdyfi and that at the age of 13, he visited King Maelgwn Gwynedd, Elffin's uncle, and correctly prophesied the manner and imminence of Maelgwn's death. A number of medieval poems attributed to Taliesin allude to the legend but these postdate the historical poet's floruit considerably. The idea that he was a bard at the court of King Arthur dates back at least to the tale of Culhwch and Olwen, perhaps a product of the 11th century. It is elaborated upon in modern English poetry, such as Tennyson's Idylls of the King and Charles Williams's Taliessin Through Logres. But the historical Taliesin's career can be shown to have fallen in the last half of the 6th century, while historians who argue for Arthur's existence date his victory at Mons Badonicus in the years either side of AD 500; the Annales Cambriae offer the date of c. 539 for his death or disappearance in the Battle of Camlann, only a few years earlier than the date of 542 found in the Historia Regum Britanniae. Taliesin also appears as a companion of Bran the Blessed in this era, by which time he was clearly perceived as a legendary figure who existed in many different times. A manuscript in the hand of 18th-century literary forger Iolo Morganwg claimed he was the son of Saint Henwg of Llanhennock; but this is contrary to other tradition. In it he is said to have been educated in the school of Catwg, at Llanfeithin, in Glamorgan, which the historian Gildas also attended. Captured as a youth by Irish pirates while fishing at sea, he is said to have escaped by using a wooden buckler for a boat; he landed at the fishing weir of Elffin, one of the sons of Urien (all medieval Welsh sources, however, make Elffin the son of Gwyddno Garanhir). Urien made him Elffin's instructor, and gave Taliesin an estate. But once introduced to the court of the warrior-chief Taliesin became his foremost bard, followed him in his wars, and wrote of his victories. Modern Welsh poet John Davies of Denbighshire (1841–1894) took the bardic name of Taliesin Hiraethog. The American architect Frank Lloyd Wright, whose mother, Anna Lloyd Jones, was born in Wales, named his Wisconsin home and studio Taliesin and his home and studio near Scottsdale, Arizona Taliesin West. His name was used, spelled as Taliessin, in Alfred, Lord Tennyson's Idylls of the King. He is a character in Thomas Love Peacock's satirical, romantic 1829 novel The Misfortunes of Elphin where he is discovered as a baby floating in a coracle by Elphin (Elfin) who is fishing. In the 1951 novel Porius, by John Cowper Powys, he is depicted as a politically astute court bard that is accomplished in both cookery and poetry. He also makes an appearance in a number of works of modern commercial fiction that blend history and Arthurian legend, including quite a lengthy appearance in Bernard Cornwell's Warlord Chronicles and Guy Gavriel Kay's The Fionavar Tapestry. In Stephen R. Lawhead's Pendragon Cycle, he is most notable in the first book, eponymously named Taliesin. He is also a central character in Moonheart, an urban fantasy novel by Charles de Lint, and appears as the chief bard of the Kingdom of Prydain in the children's novels of Lloyd Alexander which are based on the Welsh Mabinogion. The historical novel Radiant Brow – The Epic of Taliesin by H. Catherine Watling is based on "The Tale of Taliesin" and the poetry contained in The Book of Taliesin. In the young adult fiction sequence The Dark is Rising by British author Susan Cooper, he guides young protagonists Will Stanton and Bran Davies through the Lost Land in the final book, Silver on the Tree. Taliesin's harp-tuning key makes an appearance in "A String in the Harp" by Nancy Bond, a time-travel story set in Wales. The key gives Peter Morgan, the main protagonist, the ability to see visions of Taliesin's life. In Charles Williams’ unfinished series of Arthurian poems, found in Taliessin Through Logres and The Region of the Summer Stars, he is the central character, Arthur’s bard and Captain of Horse, and the head of a companionship dedicated to rooting Christian Charity in Camelot. The Norwegian classical composer Martin Romberg wrote a concerto for alto saxophone and orchestra in eight parts after the tale named "The Tale of Taliesin". The concerto was premiered in 2009 by Akademische Orchestervereinigung Göttingen, with the Norwegian saxophonist Ola Asdahl Rokkones as a soloist. The work has since been published at Éditions Billaudot, Paris and played by Mittelsächsische Philharmonie, The Saint-Petersburg Northern Synfonia Orchestra and Nizhny Novgorod Philharmonic Orchestra, the two latter being conducted by Fabio Mastrangelo. In modern music, Deep Purple's second studio album was named The Book of Taliesyn in honour of the bard. A track on the album Softs by Canterbury prog-rock band Soft Machine is titled "Tale of Taliesin". Paul Roland’s 2006 album Re-Animator contains a song about the bard titled "Taliesin". ^ The Poems of Taliesin, ed. by Ifor Williams, trans. by J. E. Caerwyn Williams, Mediaeval and Modern Welsh Series, 3 (Dublin: Dublin Institute for Advanced Studies, 1987 [repr. from 1968; first publ. Canu Taliesin 1960]). ^ "BBC Wales - Arts - Early Welsh literature - Taliesin". Retrieved 21 June 2016. ^ "The Scots Magazine and Edinburgh Literary Miscellany". Archibald Constable & Company. 1 January 1808. Retrieved 21 June 2016 – via Google Books. ^ Ifor Williams, Canu Taliesin (University of Wales Press, 1960), poem I. ^ "The Welsh Triads". Retrieved 21 June 2016. ^ "Llangynfelyn - Bedd Taliesin - Taliesin's grave". Retrieved 21 June 2016. ^ *Ford, Patrick K. 1992. Ystoria Taliesin University of Wales Press: Cardiff. ^ "The life of Taliesin the bard". BBC.com. Retrieved 23 March 2017. ^ "Gathering the Jewels". Archived from the original on 5 September 2016. Retrieved 21 June 2016. ^ "Göttingen, concert article from the world premiere of The Tale of Talisein". Goettinger Tageblatt. ^ "The Tale of Taliesin, Éditions Billaudot distributed by Boosey and Hawkes". boosey.com. ^ "Live Recording from concert in Freiberg". Youtube.com. ^ "Presentation of the Nizhny Novgorod programe 2018". music-nn.ru. ^ "Presentation of The Saint-Petersburg Northern Synfonia Orchestra programe 2016". musichallspb.ru. Haycock, Marged. 1983–84. "Preiddeu Annwn and the Figure of Taliesin" Studia Celtica18/19: 52–78. Wikisource has the text of the 1885–1900 Dictionary of National Biography's article about Taliesin. Complete text of Patrick Ford's 1977 translation of "The Tale of Taliesin" and "The Tale of Gwion Bach"
Morris-Jones, John (1918), "Taliesin", in Evans, E. Vincent (ed. ), Y Cymmrodor, XXVIII, London: Honourable Society of Cymmrodorion — the entire volume is dedicated to attacking the late dating of Taliesin by John Gwenogvryn Evans. Evans made a similar book-length reply to his 1918 critic, in Y Cymmrodor 1924, Vol. XXXIV. This page was last edited on 7 April 2019, at 21:56 (UTC).